Bedlington Town U14 Cobras, who have secured a number sponsorship deals. 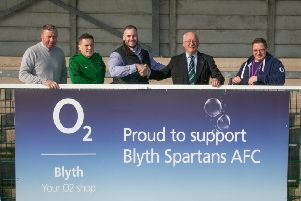 A junior football club has received significant backing from local businesses as they push for their league title and promotion in the Pinpoint Recruitment Junior Football League. Having achieved Nike’s accredited Partner Club status, Bedlington Town U14s Cobras have received backing from Short Circuit Electrical Solutions in Blyth, which has provided funds for the squad’s mid-layer tops, a necessity at training and on match-day. Ashley’s School of Motoring has provided funds for the training tops, the most common item worn by the team, and the provision of which was a much needed refresh over last season’s hot pink number. Polar Krush are sponsors of the squad’s away kit, and the company also gave the club access to one of its slush machines and the ingredients to make them as part of the agreement. This allows Cobras to generate additional funds for both the team and the club at the seasonal and annual events. Vital Service, a local information security company and long-time sponsor of Bedlington Town teams, sponsor the Malaga inspired home strips and goalkeeper kits. Bell Group, another long-time partner of the club, sponsor the team’s outerwear jackets.